I had a day of nearly-harrowing travel yesterday, in which I faced not one but two 3-hour delays and ended up purchasing an extra ticket in the nick of time (as in: second-to-last seat on the flight) that got me home at a blessedly reasonable hour. Also, in case you're lucky enough to live in a city where October has decided to behave, let me tell you about the temper tantrum it's throwing back east: the rain is coming down, and it hasn't stopped for a second these past few days. Here's the lemonade from the lemons: it's just gross enough outside that I feel not a shred of guilt about spending this weekend inside. Fortunately, the ingredients for my new favorite salad are here and ready to go, as they tend to be quite often these days. I keep a jar of the dressing on the top shelf of the fridge and regularly replenish it when it runs low. Romaine is pretty much always in the house, and at least for the next few weeks, I still have a regular supply of corn. To say this Southwestern Caesar has become a staple? Understatement of the week. At least. I should have mentioned this earlier, but this here is a CWA, a Caesar Without Anchovies, which to some of us is a potentially horrifying concept but to others will be a thrill. (How many non-anchovy-eating readers do I have? Raise your hands, y'all, and prepare to be assaulted with anchovy odes until I change your mind.) The chipotle in adobo (a canned good available in any super market) and copious amounts of parmesan cheese add the umami that anchovies otherwise bring. And perhaps most of all, this salad celebrates the power of good croutons. They're the step that takes the longest, but the payoff is big, thick croutons with crunchy fried exteriors and a satisfying chew within. Don't skimp on the time it takes to make them good. I get that salad isn't the most intuitive food for a cold, rainy day. But before you know it, I'll be extolling the many virtues of minestrone soup and braised short ribs. Let's squeeze in a few more of those cold vegetables dishes while we can. Since I never understood the urge to take something as inherently perfect as avocado and grill it, I left mine raw. I also finished the salad with some extra parmesan, because that's what you do with regular Caesar and when it comes to parm, it's never enough. Otherwise, this salad is pretty perfect. Hope you enjoy it as much as we do. 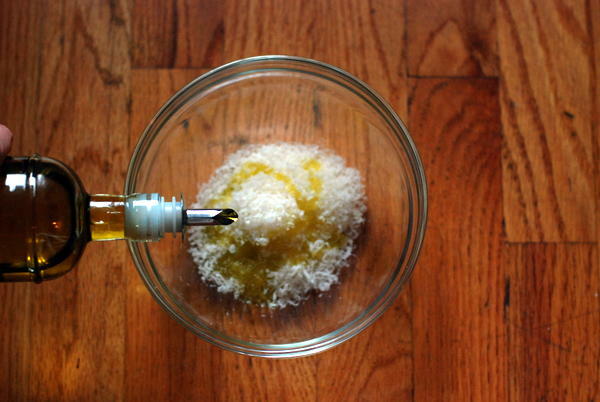 Make the dressing: Put parmesan in a medium bowl and add olive oil in a slow stream, whisking. Whisk in lime juice, garlic, chipotles, and 1/4 teaspoon each of salt and pepper.Prepare the salad: Set corn over a grill or open flame. Cook, turning occasionally, until golden-brown on all sides, 3 to 4 minutes. Meanwhile, pour olive oil into a shallow pan and set over medium heat. When oil shimmers, add croutons. Fry for 2-3 minutes on the first side, until golden. Then turn and cook on the other side for an additional 2-3 minutes. It's worth taking the time to brown the croutons on all sides - they give the salad that essential chew and crunch. 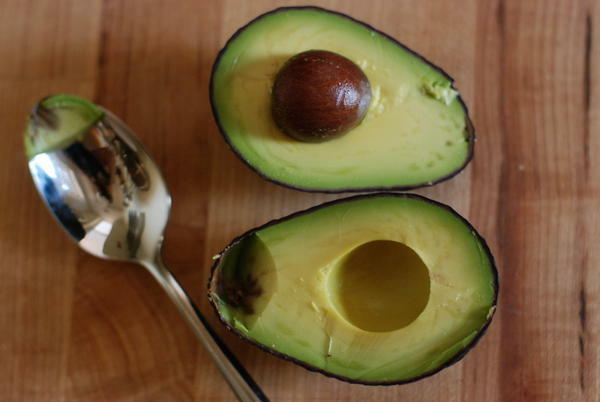 Peel avocados and cut into chunks. Cut corn kernels from cobs. 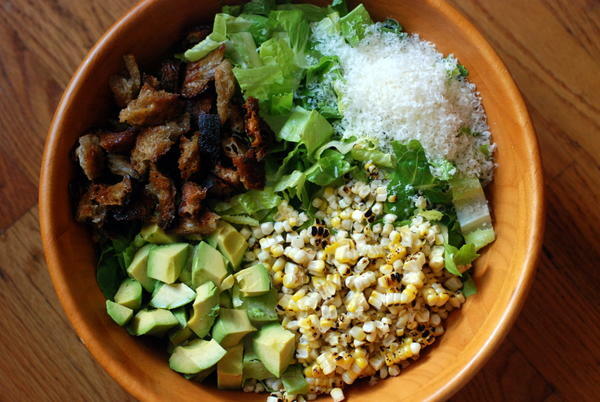 Pile all the ingredients in a big salad bowl. 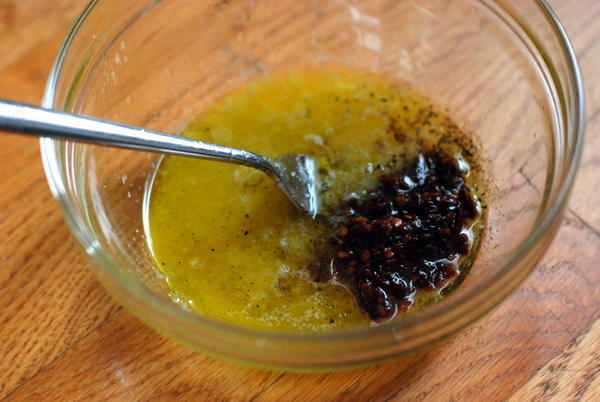 Add dressing and toss gently to combine. 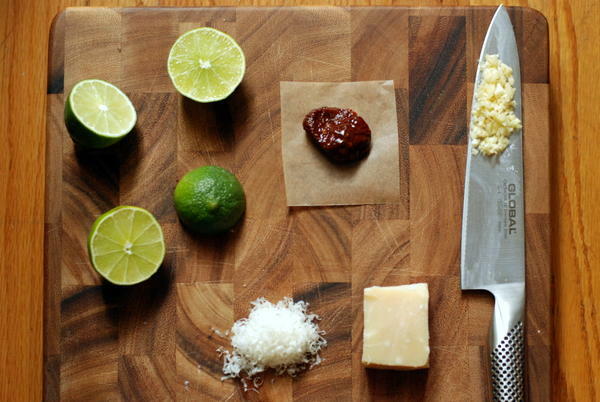 Top with extra parmesan and serve.